The impact which every action has on the environment, on the citizen who live near our plants but also on who works to produce our coffee, is very important for us. For almost 30 years we have been collaborating with the Cooperativa Sociale Onlus “La Mongolfiera”, an association which improves the life conditions of people with disabilities and of their families. For over 15 years we have produced a blend coming from organic agriculture pledging the unconditional naturalness of the product. We are licensee of Fairtrade, an organisation which guarantees products not to cause exploitation and poverty in the developing countries. It controls also the standard fairtrade purchases. Our plant is eco-friendly in order to protect the health of our citizens. Our green care has led us to the creation of a unique blend in its genre, for quality and eco-sustainability. Natura Equa comes from Central and South America Fairtrade organic agriculture. Mild, delicate, fruity with floral aromas and hints of bakery, particularly appreciated from the lovers of exquisite soft coffee, rich in hints and with lasting taste. In 2007 we chose to produce a second blend which underlines our task in the fairtrade market. So it was born Kafequo, a strong taste blend, with a full body and long-lasting cream. A blend created for those people who want to begin the day drinking a doubly good coffee: excellent in the taste and good because it is fairtrade. 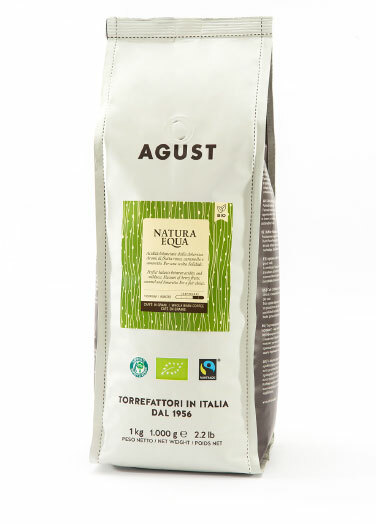 Natura Equa and Kafequo are Fairtrade certified, a feature of which we are particularly proud.